On 13 April 2017, the Secretary-General appointed Ms. Olga Algayerova of Slovakia as the next Executive Secretary of the UNECE. She took office on 1 June 2017. Tadej Slapnik, born 17 October 1973, graduated in mechanical engineering at University of Maribor. State Secretary in the Office of the Prime Minister of the Republic of Slovenia responsible for social, circular and distributed economy. A member of European Commission Expert group on social entrepreneurship (GECES), head of Partnership for green economy of the Republic of Slovenia and a member of European Blockchain Hub Advisory Board. Tadej Slapnik is initiator and signatory of Feel the future declaration: Initiative Blockchain Europe, actively involved in promotion, development and smart regulation of blockchain and distributed ledger technology at national, european and global level. He explores the application possibilities of blockchain technology for the United Nations and international aid work. Yoshiyuki is the former Director of UNOPS Peace and Security Centre. He has more than 25 years of experience in the United Nations system, mainly in humanitarian assistance and peacekeeping operations, and has spent 15 years working in various fields in Pakistan, Afghanistan, Jordan and Iraq. Ad Kroft (1954) was trained as a clinical psychologist. However, his career moved into consulting on change management and corporate governance of innovation. And more recently into effectuating digital business strategies. In 2015 he was convenor of the Dutch Blockchain Coalition, an initiative taken by the Dutch government. Currently he works there as program director for standardization. He also is member of the EU Blockchain workgroup on Policies and Framework conditions and TC 307 Standards for Blockchain. Focusing on areas such as human rights and financial inclusion, he is leading ConsenSys' efforts in equipping social impact organizations with blockchain solutions. After spending time working in the political sphere, including an internship with Massachusetts Senator Elizabeth Warren, and a stint at the European Parliament, Ben spent his senior year of college taking an in-depth look at the way we currently handle humanitarian aid. As a result, he became extremely interested in experimental technologies, specifically, the growing role they have to play for the impact sector. Post-graduation, Ben became increasingly enthralled with blockchain’s potential as a tool for social change. This led him straight into ConsenSys, where he co-founded the Social Impact team as well as the broader Blockchain for Social Impact Coalition (BSIC). He is dedicated to bringing blockchain technology more directly into social impact work, and bridging the gap between technologists and humanitarians. With nearly 2 decades of experience in the Power Industry, Mr. Novak is an accomplished leader in the energy sector. Having worked in two of the most important and complex national electricity companies in the Republic of Slovenia, he has amassed wealth of skill and experience in the areas of electricity utility management, process management, regulatory framework of electricity sector, technical operations, information and communication specifics in power engineering sector as well as the more recent and disruptive blockchain technologies. Oversees the work of the UN Centre for Trade Facilitation and Electronic Business (UN/CEFACT). She has 19 years of experience in Trade and Transport Facilitation within UNECE. She currently manages a group of some 500 experts working on Trade Facilitation projects to produce Trade Facilitation Recommendations and electronic business standards, covering both commercial and government business processes that can foster growth in international trade and related services. 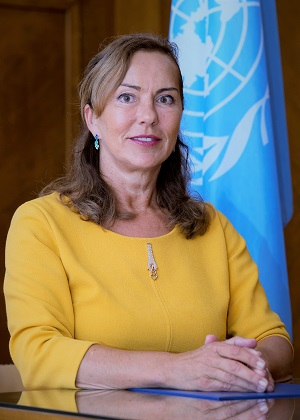 In her former position in the UNECE’s Transport Division, she provided training and advisory services to promote the development of border-crossing facilitation and multimodal transport and supported member states in formulating strategies, policies and actions to facilitate transport developments in countries with economies in transition.